What are the blockages preventing integration between health, care and housing? What are the solutions needed across the system to transform health, care and housing? What are the implications for housing supply, commissioning decisions and care pathways? how health, care and housing integration would look in an ideal world. 2. What does good practice look like, both in terms of prevention and integration of health, care and housing? Anchor presented a case study of how they are tackling the problem in Birmingham and how outcomes have changed. This session was also an opportunity for participants to share other examples of good practice from around the country. 3. What needs to change, both locally and nationally? Jean is a 73-year-old homeowner. While she has had chronic pain for most of her adult life, she has always enjoyed going out to socialise and work in her community. However, having become increasingly frail, she now struggles to get out and has some problems with the stairs at home. Her husband passed away and her only son moved to Australia with his young family. While Jean has not been good at saving money, her financial situation is generally stable and she has equity in her property. She lives in an old house that is in a state of disrepair. 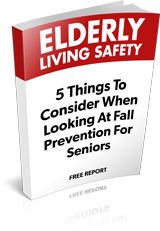 Jean recently had a fall in the kitchen, which resulted in a visit to hospital. 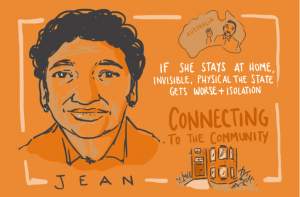 In the current system, Jean would be sent home from hospital to face mobility issues around her house. She would increasingly rely on others and would likely become more housebound. to make her aware of the options available. been when she was bereaved after the passing of her husband – a trigger is often required to drive curiosity and investigate alternatives. For Jean it would also be important to understand how to maintain her connection to her local community. “Even if Jean should fall again while living in her own house where she much more comfortable in her own surroundings. Laura is 82 years old and has lived in long-term rented property for most of her married life. With minimal savings, she and her husband have not been able to buy a place of their own. Laura recently fell and broke her hip. While in hospital, it became clear that Laura is also experiencing memory problems and heavily relies on her husband for support. He has been able to look after her but is now starting to feel the strain. In the current system there were a few key points made about the pathway Laura and her husband would likely experience. After Laura’s hospitalisation, they would want to return home as a couple. However, it is likely their private landlord might not understand their needs, and there would be challenges in adapting their home to make it more suitable. In an ideal world we would want to see a preventative approach, one where Laura and her husband might have been encouraged to look at supported housing options earlier on, prior to crisis point. They would look to use neighbourhood networks and get better support from their community and would have a clearer understanding of how local services link up within health care. They would also have better information about voluntary sector support and their alternative housing choices, along with practical help in making things happen. Challenges for Laura might be the anxieties of family members about them returning home and whether they would be able to cope. It is important to include the family early on in the decision making process. Paul is an 85-year-old single man living alone after a divorce. Paul has always been an active member of his community. He and his neighbours help each other out where possible, and he often meets friends at the local pub. 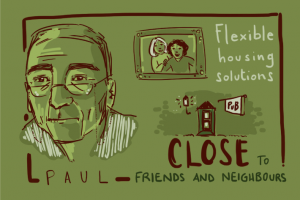 Paul lives alone in a social rented property with support from housing benefit. He doesn’t have much money but manages to get by. He has two daughters but neither live close by. Paul’s health has always been OK. However, he recently had a stroke, and although he has been recovering quite well, he finds he has slowed down a lot and needs more support in from his neighbours and friends. In the current system Paul has a good chance of recovering well, provided he is given the appropriate support. While he is likely to have some contact with health professionals, there is likely no single person within the system to notice if his strong community network starts to weaken. With no single point of contact to coordinate his care, it is likely he will repeat his story over and over again with no one agency holding the full picture. In an ideal world, we would want his support embedded in the networks he already has. He may not require any support, but would benefit from wellbeing checks from a trusted single point of access. The key challenge in Paul’s scenario is, if now is not the time for statutory services to pile in to help, then who notices if his community starts to break down or things change? And who’s role is it to mobilise his local community and ensure his social networks remain strong? We have heard time and time again that if systems were more joined up, we would deliver better quality and better value services. Why does this not happen often enough? The answer is not because people don’t want to do it or don’t see it as important, it is because it is too difficult. Actors within the mental health care system have a better understanding of the need to provide an integrated service than other parts of the health service. This is because they have a recent history of working across services and in the community – they understand because they have been doing it. How can we learn from this and apply it to housing, health and care for an ageing population? There are examples of good practice across England. We need to learn from these and see where it is possible to replicate them, e.g. Anchor’s Birmingham project and Ealing’s fast track adaptation services focused on getting people home from hospital quickly. Good practice is occurring – why are we not successfully transferring these lessons to other areas? There are some interesting attempts to deliver integrated models of care, e.g. the NHS England have 25 Integrated Pioneers leading new approaches to integrated health and social care and 50 Vanguards to take a lead on the development of new care models, but housing doesn’t feature very much in them. We need to build housing into existing vanguards. We talk about initiatives that save money for health, but hardly any of them do – as soon as there is another hospital bed available, there is a person in it. Health care costs are rising and we need to move away from a narrative of cost savings. Instead, we should focus on using money better to deliver better outcomes. policy implications. 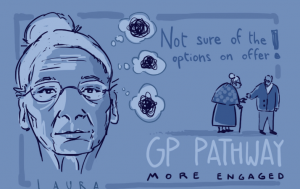 How we deal with an ageing population requires action across policy issues, e.g. transport and housing. We need an economic and needs piece to look at how the total pot of money in NHS is being spent vs. what the local need is. There is no Government strategy for older adults and no housing strategy that considers an older population. Homes are often not built to lifetime standards, and there is inadequate understanding of the role of properly thought through housing provision. We need local government to adopt lifetime standards, learning from examples like London, where lifetime standards is the default for all new homes. have a strong offer. If evidence is missing, the housing sector would happily support the gathering of this evidence but they need buy in from health partners. Timescales to which people manage are different in housing and health – housing tends to focus on the longer term, and health on the shorter term. Future cost savings are not considered when current costs need to be funded. There is a strong link between existing housing, social care and health, but no one who thinks it is their responsibility to take the lead or fund a joint initiative. We need to work out who is going to lead it and who is going to fund it. Older people themselves need to change their thinking – we need more active older citizens who can play a more central role. We need more opportunities for older people to collaborate, design and inform these services. Public services need to focus on a more person-centred approach. It is essential to consider the role of communities in supporting later life, how this can be sustained and value this as an important element of the solution. Local planners should look at their demographic and explicitly say how they are going to plan for an ageing population in their local area. There is an urgent need to look at Sustainability and Transformation Plans plans and ask: where is housing? 6. EARLY INTERVENTION AND PREVENTION IS KEY, BUT HOW DO WE MEASURE IMPACT? If we want to make a sustainable case that housinghas a role within health, we need to talk about how improving housing is part of early intervention and prevention. something from happening, how can we measure the impact we had on that? In an event focused mainly on specialist housing, the role of mainstream housing and how we adapt existing homes was a recurrent theme. Not all homes are being built to lifetime standards. Planners need to understand the implications for the older population and for the type of housing being built in local areas. Anchor presented how Birmingham are tackling the issue of delayed discharge from hospital.